ADE Chain Takes the Leading Role of the Cross-border Social E-commerce! GUANGZHOU, CHINA / ACCESSWIRE / November 9, 2018 /Since 2018, Pinduoduo has received a huge amount of financing of more than 3 billion US dollars, followed by the completion of B-round and C-round financing respectively of Yunji and Gifts, as well as the successful listing of the Youzan. All kinds of signs once again prove that the "new mode" of social e-commerce in the Post-E era has come to the fore. As the industry leader of cross-border social e-commerce platform, UniPlaza has successfully established its own marketing team and operation team in more than 20 countries and regions around the world since 2012. It has successively launched complete marketing programs and implemented them in many countries. UniPlaza integrates the global logistics system, supports 13 global mainstream languages, links more than 150 mainstream social platforms with one-click forwarding links, and covers 90% of consumers in countries and regions around the world. UniPlaza technical team independently researched the ATS automatic trading system, which obtained more than 30 international patents. The team built a complete cross-border social e-commerce transaction closed loop, and launched the first innovative mode in the industry in the aspects of product service display, transaction payment and logistics delivery. At the same time, UniPlaza has international patents covering cross-border settlement, distribution and settlement, and user relationship chain algorithms. It solves the multiple problems of cross-border social e-commerce such as payment, social networking, logistics, supply chain, and becomes the only cross-border social e-commerce platform capable of doing global business. UniPlaza brings a mature and convenient global cross-border social e-commerce model to the world through tangible high-quality services and institutional guidance. 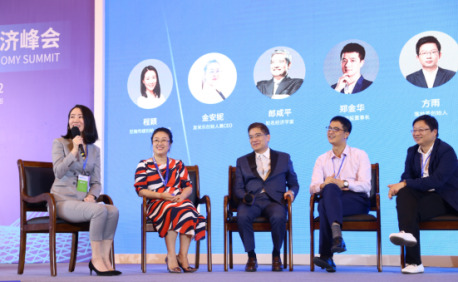 The Highly Praised "Social Network Business Like Alibaba"
At the 2018 World Expo Social E-Commerce Session, Ms. Anne Kim, the founder of UniPlaza, was invited to take the stage to analyze UniPlaza's new global cross-border social e-commerce model for Internet economic experts from more than 20 countries and regions around the world. After the speech, Ms. Anne Kim was invited to participate in the Global Social E-Commerce Roundtable Forum to discuss the impact of social e-commerce on the new economic structure of the Internet with international renowned economists such as Larry H.P. Lang. UniPlaza's unique social e-commerce model was highly praised by Larry H.P. Lang for breaking the traditional pattern of social e-commerce. UniPlaza's cross-border social e-commerce model embodies the essence of sharing economy in the Internet age, focusing on the integration and output of services, information and content. Seeking a balance between "extreme product and services" and "ordinary price", the foothold of UniPlaza Platform is to share among friends and to do every detail with the most devoted ingenuity. UniPlaza has always been committed to promoting the mature social e-commerce model to the world, sharing the really valuable good things to the people all over the world, so that people are willing to share and win the life they want. It facilitated buyers and sellers, the platform and the logistics side which will achieve a win-win situation and the happy vision of UniPlaza and the world. Organization: Guangzhou Youmi Technology Co., Ltd. SOURCE:Guangzhou Youmi Technology Co., Ltd.